Our club now has a one stop website to order club regalia. On the left corner of this website is a list of categories with embroidered logos. Category 4 is British Cars-there is a red Sunbeam Alpine here. 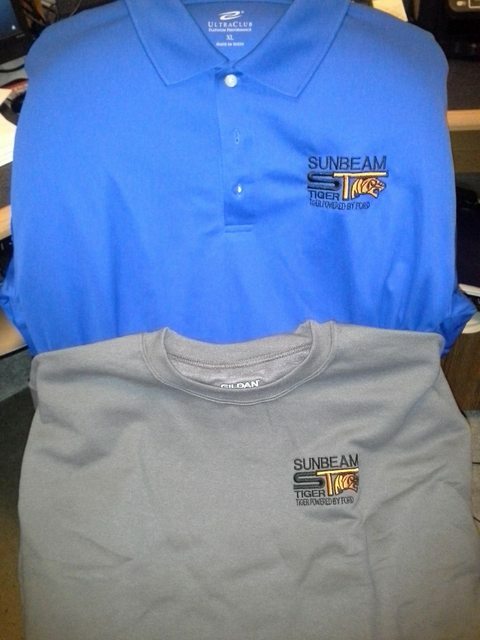 Once you have picked the embroidered logo you want to use, you can select different T-shirts, golf shirts, ball caps, jackets, and even a tool bag you can have the logo applied to. And if you have other non-Sunbeam British cars there are many other Marques to choose from. You then check out and pay on line and then receive your item in the mail-just in time for your next car show or event! Re: Order TE/AE regalia on line! A lot of nice stuff on there. Has anyone ordered anything? The "logos" and the "apparel" seem to be separate items? [to me] the process does not seem "intuitive"? Is this a U.S. based outfit? This company is based in North Carolina and did all the shirts and some embroidered items for the Dayton, Ohio United. I was pleased with the quality of all items and the price too. You can call them if you have problems on their website-and they have other items you can order not shown on the website as well. I will soon advertise some nice heavy weight fleece jackets that have the Tigers East Alpines East logo embroidered on the front. They just arrived. I [finally] just talked to Ralph there at fourth-gear-ltd about a couple of items (called on phone). Ordered TE/AE regalia on line! here's a photo of the 2 items that I bought - they look great and as I noted earlier, Ralph got exactly what i wanted (even tho not in 'catalog").